“Battle! Good Shape” is the first large fitness equipment interactive Internet show co-produced by Migu and Visionary Media. Beining Sa, the leader of fitness team, and 8 fitness KOLs of both good shape and good appearance form the best fitness team. 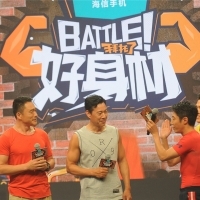 In each episode, the program will invite two stars with different needs of fitness. Sa, with the help of 8 KOLs will fulfill their needs. 2 stars will separately enter a team with 4 KOLs. 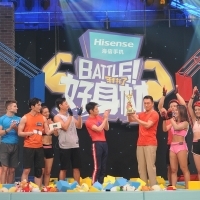 Each team will battle with small games and delicately designed large fitness equipment. The winners can select a KOL and give him the title “The Best shape”. The show is filmed and broadcasted lively on Migu. 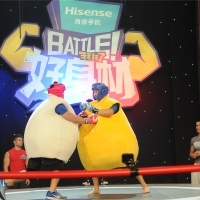 Audiences can vote for the team, and their vote can decide the level of difficulty of the final challenge: the large fitness equipment. The spectators’ vote can actually influence the result of the show. “Battle! Good Shape” aims to spread the knowledge of fitness, and share tips for sports. It conveys the idea “Everybody move, no limit for fitness”. Not only stars take parts in sports in the show, but also ordinary people in front of the screen.